Writing, Surviving & Thriving: Achievement gap at infancy...What?!? I used to want to teach kindergarten. Since Little Miss TJ has entered my life, my interest in early childhood education has been reignited. My husband and I trade child-rearing and educational articles for sport. He sent me this article, and it has been circulating in my education social media feeds all day. It sent me over the edge in a way that I didn't expect. I think the title is what triggered me. It is rooted in deficit thinking and language. I call BS on some of this article. I get the point of it and the intention, but I still call BS. If you've been reading for a while, you know I can't get into achievement gap rhetoric in the first place. 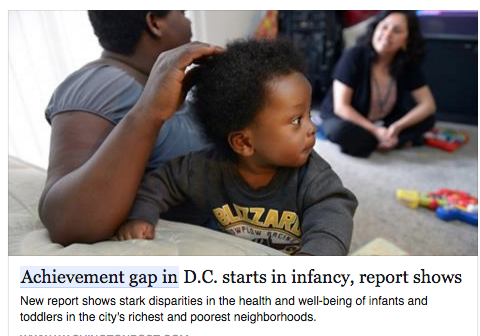 Achievement gap in infancy? Get out of here. What about honoring the knowledge that children bring with them to school, and what about addressing issues of longstanding social injustice? Time and time again, we've seen that when we (1) address social issues AND (2) equip parents with knowledge and skills, kids thrive. Folks always want to fixate on Step 2 and ignore Step 1. I think that's why I'm so annoyed. We're forcing too much inauthentic learning down kids' throats anyway. Who gives a damn if your baby can read? If they were meant to read, they'd have fully developed language. Besides, experts in early child education have said that PLAY is the best way to grow little minds. You mean to tell me the little ones referenced in the article don't have imagination and know how to play? They have to learn how to do a lot with a little, and if that isn't imagination and innovation, I don't know what is. There is a "gap" because people are putting too many academic rigors on babies and not addressing larger social and institutional forces at play. And while we're on gaps, lets talk about opportunity and exposure gaps instead of achievement gaps that put the problem on the shoulders of kids. Here's the thing, and I don't know how to dress this up nicely - They (meaning the systems that be) will never give poor, Black kids the kind of play-based education research has shown that young kids need and that affluent parents pay top dollar to give their kids (I'm presently on the hunt). They'll keep forcing reading down 4-year olds' throats and calling them dumb when they don't rise to the occassion. This isn't to say some little ones don't have the natural desire, inclination, or ability to do so, but it's ok if they don't. Some children need more time than others. We have to learn how to let children develop on their own terms (barring any serious issues) and stop panicking every time they don't hit some developmentally inappropriate target. CAN THE KIDS LIVE?!?! After reading the actual report the article cites, I feel a little more at ease, but I'm still coming down. Until next time . . . let's encourage policy makers to read some early childhood research. I love this comment! This is very real to me because of the 3 year old daughter. I couldn't have said it any better. Hey!!! Thanks for reading. Girl, this stuff is weighing so heavy on my heart. We need to go back to square one and reevaluate how we are teaching our little ones. Hell, when I was in kindergarten, we learned the alphabet; now all of a sudden a kid is "slow" if they need more time to develop reading skills AT 5 FREAKING YEARS OLD?!? Whew, let me get off my high horse and do some work. Lol. Hugs! Hope all is well.